Different countries and regions grow all types of cauliflower, ranging in size and color, including green and purple. As a cruciferous vegetable, cauliflower is high in vitamin C, antioxidants and fiber, and is considered helpful in preventing heart disease, cancer, and high cholesterol. So, yes, even though cauliflower is as white as snow (well, almost), it is high in vitamin C.
Now, let’s get to the recipe. 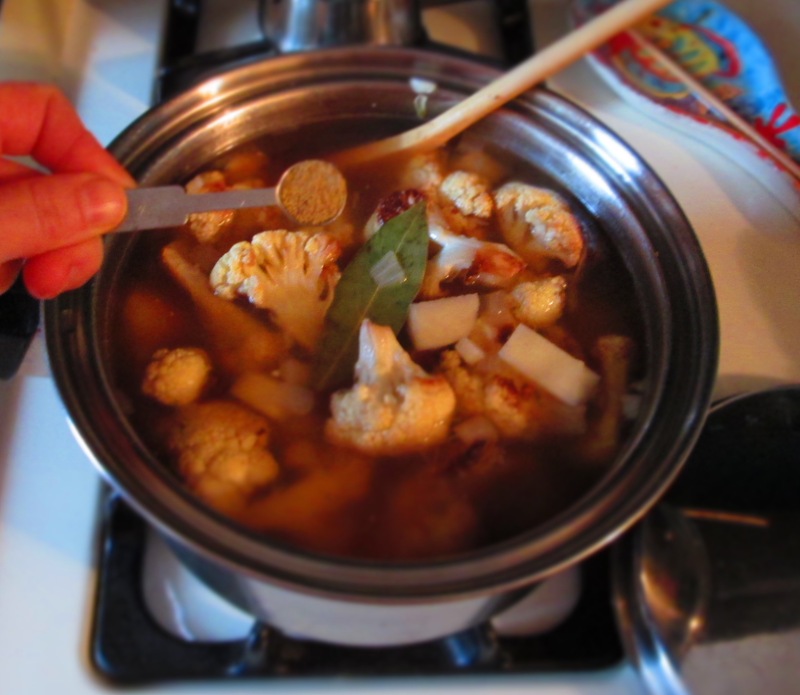 This is a very easy soup to make. I’ve made it vegan by omitting the typical cream (or half-and-half), so in order to make it thick and creamy, I’ve added 1 medium potato. 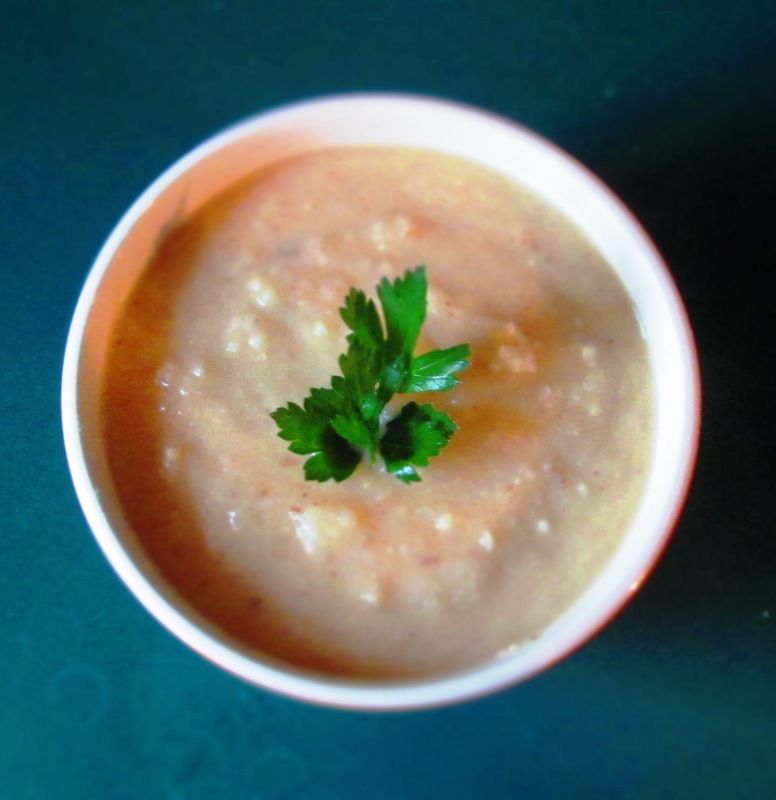 I love creamy soups, but I prefer to have a bit of chunkiness in mine, so when it comes time to puree it, it’s up to you to decide how much to puree. 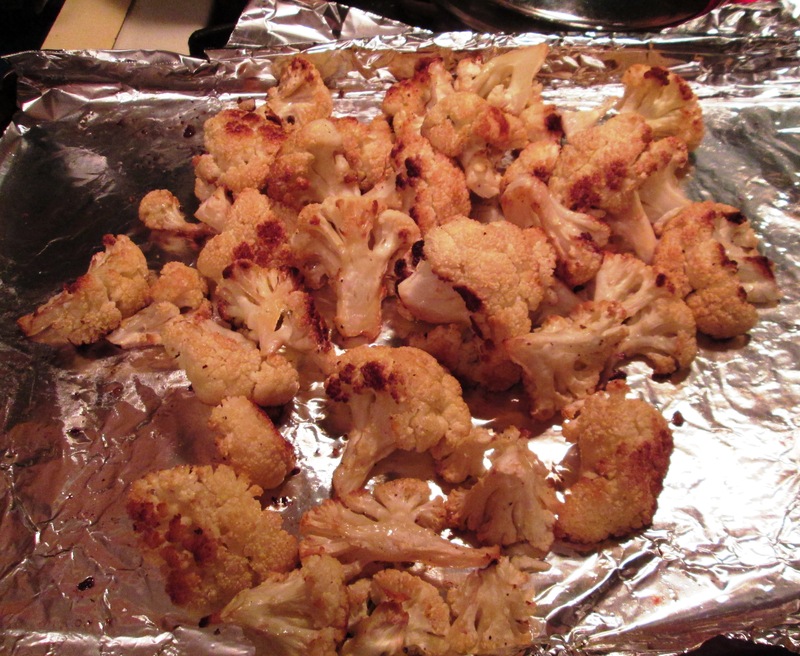 To make the soup even more savory, I roasted the cauliflower first, which really brings out its sweetness and flavor. I’m fond of ground fennel seed and use it quite a bit in my recipes; if you want, you can substitute any other spice you like, or just omit it. 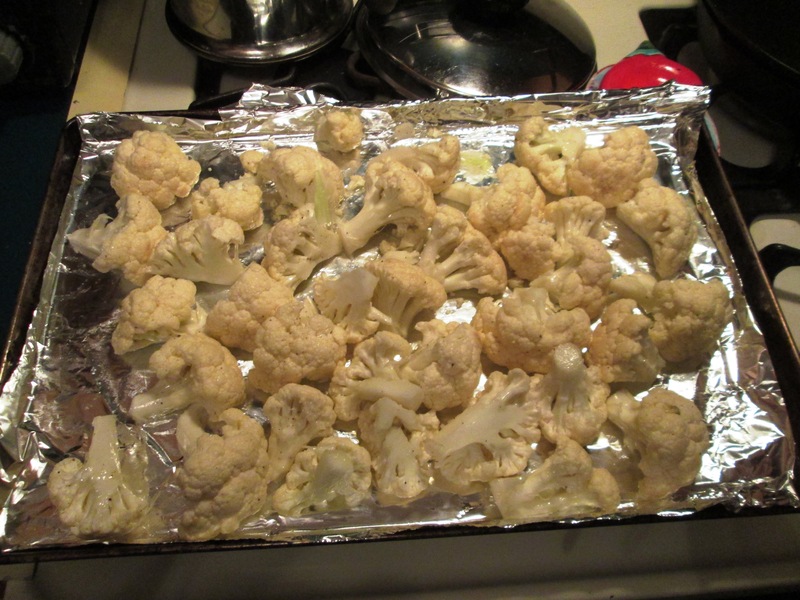 Preheat oven to 400 degrees F. Cut the cauliflower into equal-sized pieces and place in a bowl. Add ¼ cup olive oil, 2 teaspoons salt, and black pepper. Mix so that all pieces are coated. Transfer to a baking sheet. Roast until crisp-tender and golden brown, approximately 30 minutes. Stir halfway through. In a medium sauce pot, heat 2 teaspoons oil. 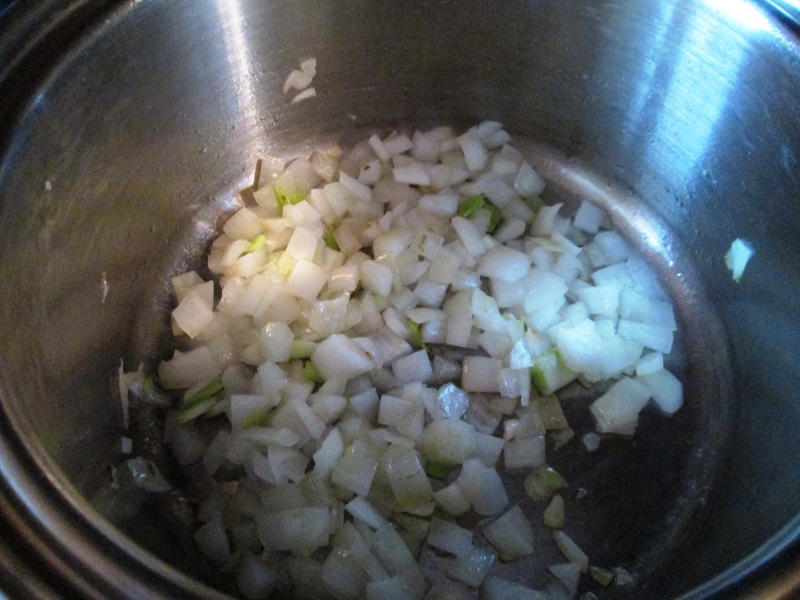 Add onion and 1 teaspoon salt and sauté until translucent. Add garlic and sauté another 2 minutes. Pour in 5 cups broth; cover and bring to a boil. Add cauliflower, potato, bay leaf, fennel seed, and 1 teaspoon salt. If all ingredients are not submerged, add remaining broth. 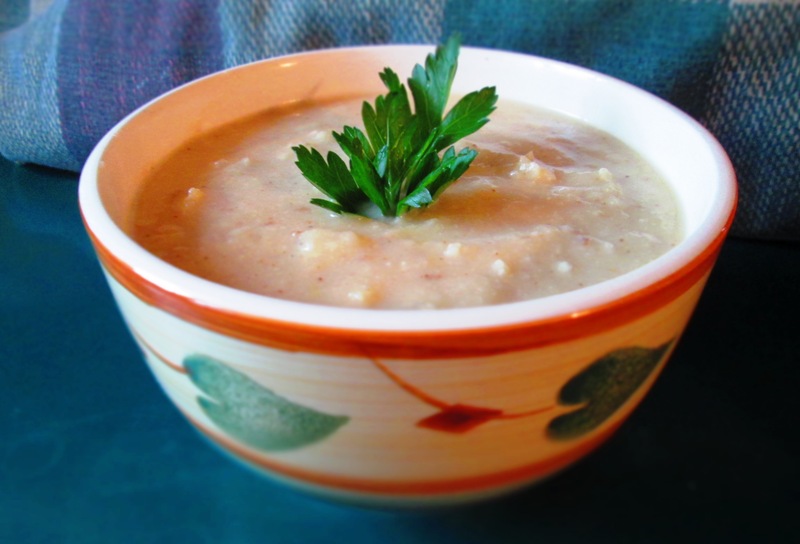 Bring back to a boil; lower heat and simmer until cauliflower and potato are fully tender when pierced with a fork. 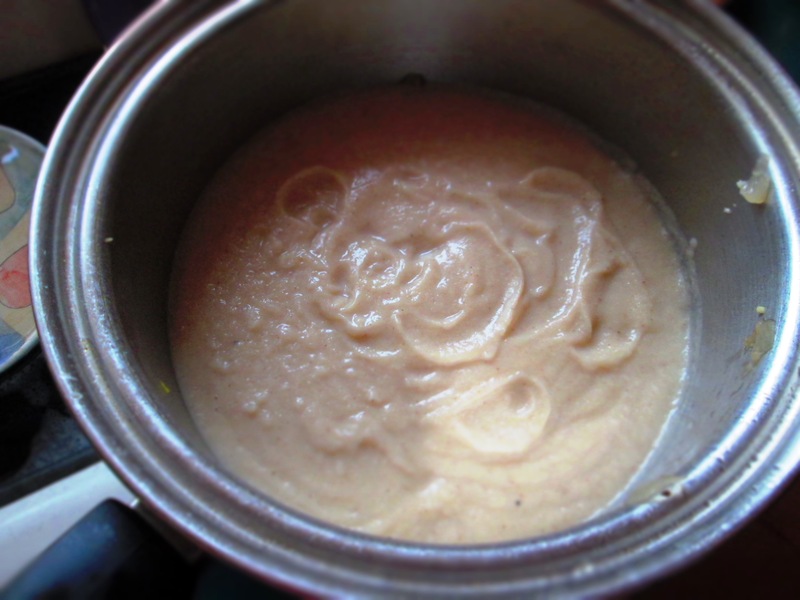 Transfer half the soup to a blender and puree (be sure to hold the top down with a kitchen towel). If you want to leave it chunky, pulse the machine a few times so that it doesn’t fully puree the contents. If you want to thin it out, blend in a little more broth or water. Pour both batches back in to the pot or the bowl. Taste for seasoning; add remaining salt, if necessary, and more black pepper, if you like. *Ground fennel seeds: Place a teaspoon fennel seeds in a coffee or spice grinder and grind until powdery fine.